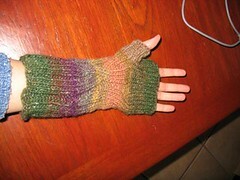 I finally got around to finding my ball of Boku scraps and adding some thumbs to the fingerless Hyphening mitts I was making for my friend Ken back in November, when I visited him in New York! I was dashing (Ha! ha! that is a Pune, or a Play on Words) to finish these for him as a thank-you gift for letting me stay at his place. I misread the amount of yarn called for in the pattern, brought only 1 skein of yarn, and thus ran out of yarn before I got to the thumbs, so I ended up giving him a 3-D drawing pad instead. But he’s quitting his Corporate Suit job soon and taking up a new, thrilling, idealistic, creative job at a nonprofit, so I thought it would be a good congratulations-on-the-new-job present instead. Mods:First of all, I made these much shorter than the pattern called for–hyphens instead of dashes–bound them off after the 15th row after the last cable twist. When I resurrected the project tonight, I inserted afterthought thumbs: snipped a single stitch on each mitt about 2.5” down from the top edge, and unraveled to either side until I had 5 sts above the hole and 5 stitches below. I put these live stitches on DPNs, then picked up an additional 3 sts on each side of the hole for 16 sts total. 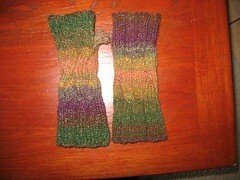 I knit 1 round, then worked the thumb in 1×1 rib for a total of 9 rounds, and bound off with a suspended 1×1 rib bindoff. Easy as pie, and it took probably half an hour. Notes: The mitts are pretty loose-fitting on me, but probably will work well for my friend, assuming he doesn’t have tiny, skinny, bird-boned hands. Because I don’t have a professional photography setup, these pictures were taken with flash and look terrible. 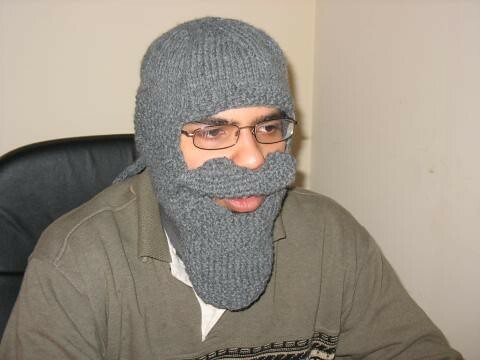 Also, I added a couple more things to that bearded hat that make it even more amazing. Then I thought about what I would want if I had a beard of my very own, and I said to myself, Well, I would want to store things in it. That’s what I would want. So I added a little pocket to the inside of the beard, with a button flap, so now Rahul or I can hide little treasures in the beard. 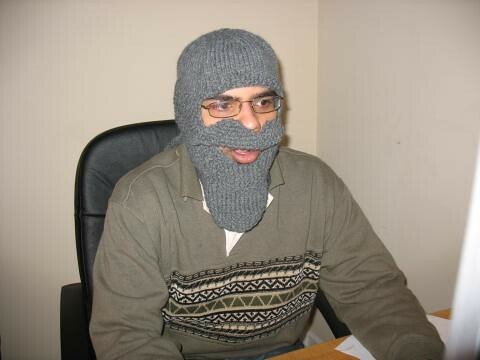 If we lived in Boston or Hong Kong or another place with RFID-based public transit cards, I could put my Charlie Card or Octopus Card or whatever in the beard and just casually wave my chin over the sensor as I went by, like the Subway Knitter’s mittens, but with more panache. 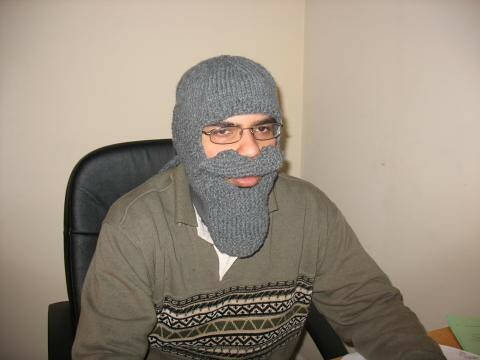 I have not yet extracted any promises from Rahul regarding his wearing this hat in public, but he did go and look at himself in the mirror for a while and adjust his mustache (he prefers a narrower mustache, with the bottom edge folded up) and then announce that he wanted to grow a big gray beard himself. Here he is, working on a marketing assignment about cereal. Ties: At about 5.5” back from each side of the beard, at the lower edge of the cap, I picked up 6 sts with the yarn single-stranded on a size 6 DPN and knit an 8.5” tie in 1×1 rib, slipping the last st of each row and knitting the first st.
Pocket: Cast on 15 sts single-stranded on size 6 DPNs. Work in half-linen st for 3.5” (3” wide), knitting the first WS row instead of purling to create a ridge at the top of the pocket. Bind off. 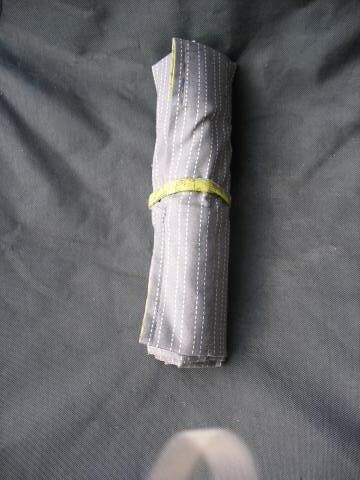 Pocket flap: CO 15 sts single-stranded on size 6 DPNs with long-tail cast-on. Work 7 rows half-linen st, ending w/WS row. Work 6 or 7 sts (last st s/b k), yo, k2tog, work to end. work 1 row even. k1, ssk, work to last 3 sts, k2tog, k1. p1, p2tog, work to last 3 sts, ssp, p1. k1, ssk, work to last 3 sts, k2tog, k1. BO all sts. 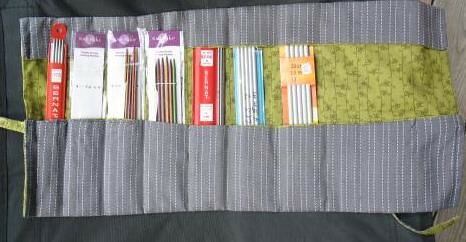 Use yarn tail to buttonhole-stitch around the edges of the buttonhole to tidy it up. Sew the pocket in place, then sew the pocket flap directly above it. 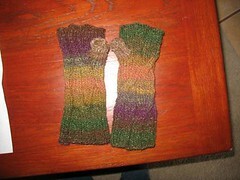 (I used the yarn tails to do the sewing, and just whipstitched around the edges, being careful not to pull too tight.) 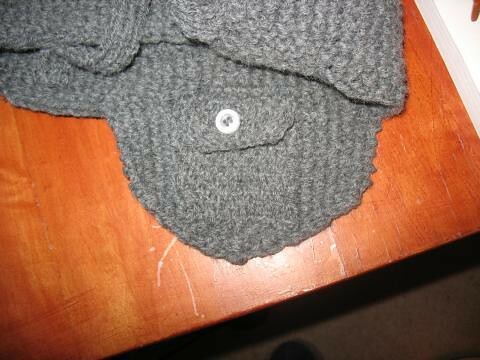 Sew button to pocket in location corresponding to pocket flap buttonhole. I knitted the pocket pieces separately and sewed them on because I wanted them to be as invisible as possible from the outside, and I thought picking up stitches would be more visible. I used half-linen stitch because it doesn’t have a lot of stretch, and I thought it would make for a more stable and strong pocket. “Efrivararskegg” is the Icelandic word for “mustache,” apparently. 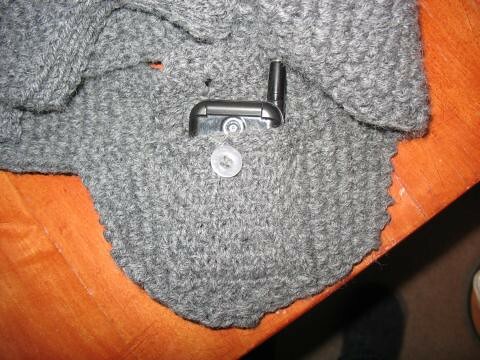 Yarn used: Lion Brand Wool-Ease in 152 Oxford Gray, double-stranded. I used about 1.5 skeins total. Machine washable, and I got it on sale for $2 a skein at Jo-Ann yesterday, plus a 10% off everything coupon. So this hat cost less than $4 to make! 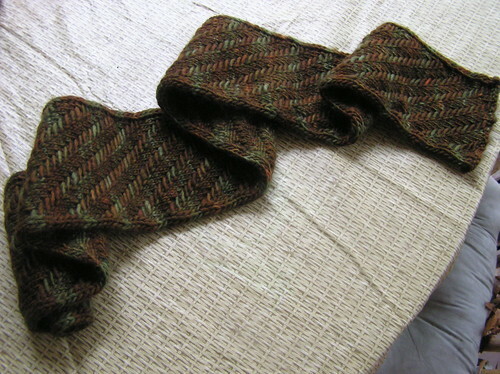 Mods:Instead of knitting in the stitch 2 rows below as suggested for the increases, I knit in the front of the stitch below for KLL. 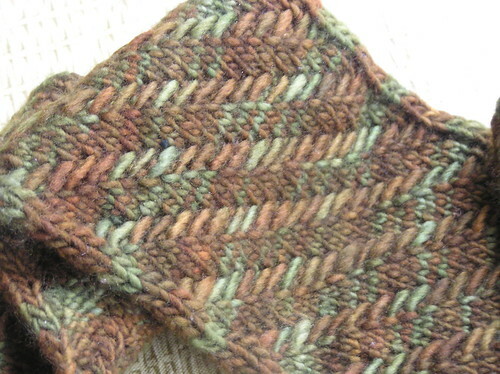 Gauge was off: 3.5 sts per inch instead of 4.5, but it seems to fit fine at the given stitch count. 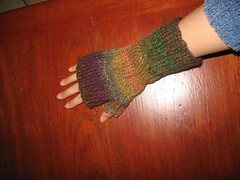 I used the yarn double-stranded on size 8 needles, which made for a firm, thick fabric. 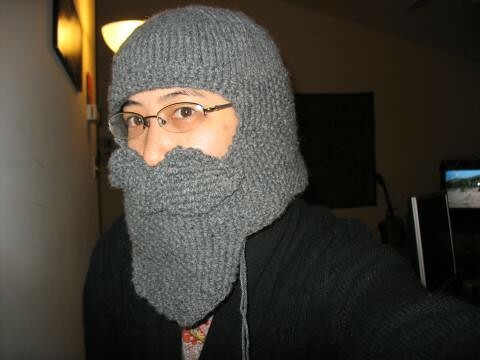 For the seed stitch part, I ignored most of the directions about shaping it and just knit about 1″ of seed stitch even after the hat was about 5.5″ from the crown, then (at 6.5″) bound off 20 sts at the front as specified. I did do the two k2tog decrease rounds and followed the rest of the face shaping instructions as specified, up until the part where you’re supposed to start shaping the beard. I bound off stitches at the back neck until there were 43 sts remaining at the front (20 sts + 3 soul patch sts + 20 sts), then bound off another 10 sts on either side using the sloped bindoff (leave 1 st unworked, turn, work 1 st, pass slipped st over worked st, BO remaining sts as usual). I worked back and forth on the beard for about 1.5″, then bound off 1 st at the beginning of the row for 2 rows, then bound off 2 sts at the beginning of each row until about 6 sts remained–bound off all of these at once. I made the first example mustache, using ssk where applicable and using sl1-k2tog-psso as the double decrease at each end. 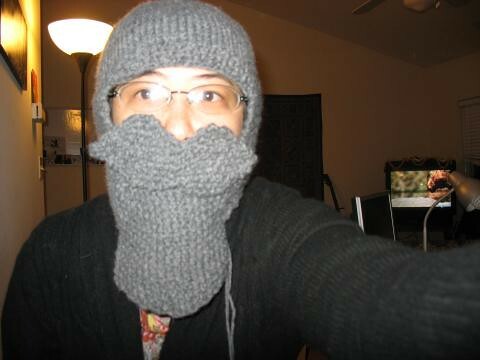 Notes: I made this for my boyfriend, who normally wears a ski mask when he rides his bike to school in the winter. He was curiously unappreciative when I presented it to him and said he would wear it on Halloween. I am hoping to get him to wear it when he bikes around town. I can’t believe he doesn’t find this hat as hilarious as I do. 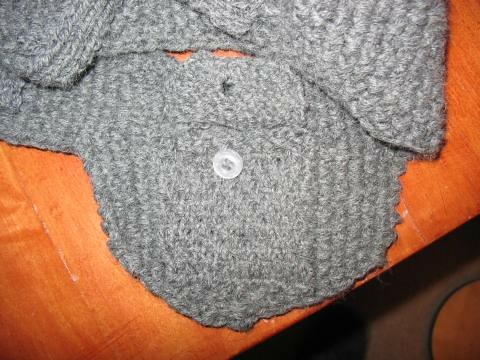 I loved using Emily Ocker’s circular cast-on and knitting this hat from the top. When I had to have the victim try it on, I put some of the sts on my DPNs rather than on waste yarn–then I could just knit right off them when it came time to continue. The fit around the neck is not great, kind of baggy–if I made it again, I might try adding some decreases around the back of the neck. 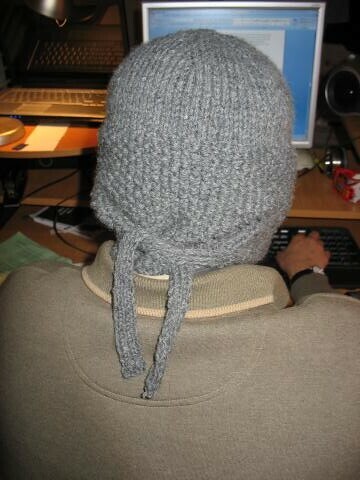 For this hat, I may have to add a button and loop to gather in the extra fullness at the back. Also, the mustache seems sort of loose. I may have to reposition it. 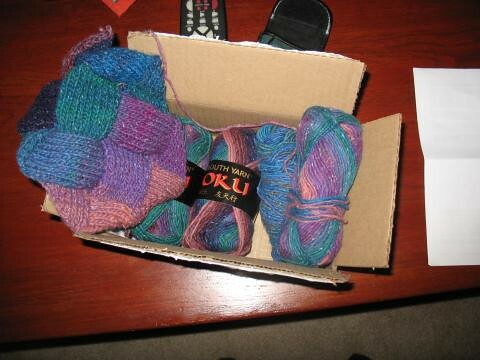 I got this amazing Random Act of Kindness package this weekend from Raveler Zanna, who tried out Plymouth Boku and didn’t like it, noticed my rabid love for this yarn, and sent me the 4 skeins she didn’t want. And I think I may have been remiss in mentioning this before, but I also got a RAK recently from knottygnome, who sent me a copy of Rusted Root, which I may make with some of the red Cotlin I’m getting soon in a swap with Leigh. I am sometimes just amazed by people’s generosity. If you’re reading this, Zanna and Sara, thank you, again! I have some baby things I made to post about next time, but in the meantime, here are some beautiful photos of a beautiful Prismatic Scarf made by a Raveler named JellyJ. 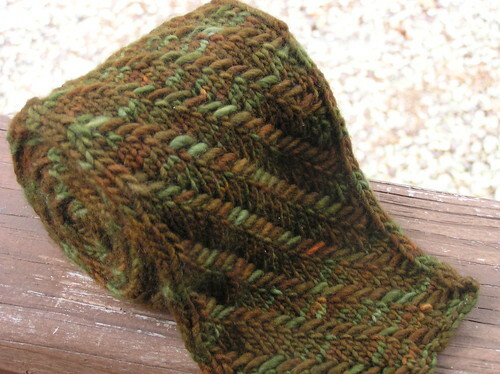 She used Malabrigo in Autumn Forest and I think her photos and finished scarf are just gorgeous–if I do say so myself.